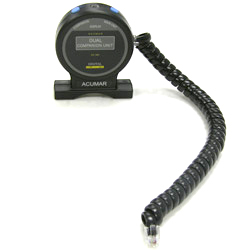 The Companion Unit and Connecting Cable allows you to upgrade your Acumar Single Inclinometer to an Acumar Dual Inclinometer. Dual-inclinometer technique and procedure is well defined in the 5th Edition of AMA Guides. The Acumar Dual Inclinometer contains modern features that simplify measurements and increase objectivity. Acumar Dual Inclinometers can simultaneously capture both angles by the press of a single button. It allows up to six pairs of data for viewing and recording to greatly speed up data capture and analysis. Lafayette Instrument Company is partnering with Metriks Education, Inc. to offer private LIVE video conference training for the Acumar Inclinometer. Save money and travel time by logging in from your home or office to receive one-on-one training from an industry expert. For more information about the course and our partnership, visit the Range of Motion Training area on our website. Lafayette Instrument manufactures devices that comply with United States FDA Medical Class 1 rules. Warning: The medical devices advertised on our website may not have been licensed in accordance with Canadian law. Compact, handheld unit features large digital display for easy reading. Store measurements with the hold button, and review maximum, minimum and average values. Package contains both a Digital Inclinometer and a Companion Unit with connecting cable.